As the FINIA partners would be aware, we have been looking at the issue of introduced plants in the coastal settlements and garden “escapees” that can become weeds impacting on the island’s native plants. 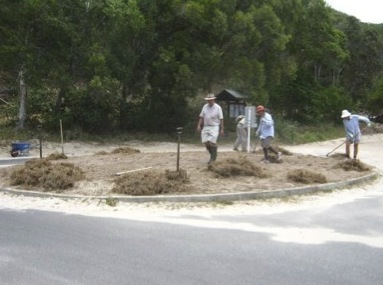 Following an idea raised through FINIA, a number of our members – Fraser Coast Regional Council, Fraser Island Defenders Organisation (FIDO), Queensland Parks & Wildlife Service and Cooloola Coastcare’s Michael Lowe have been working to establish a native plant display garden at Eurong. Through the gardens we hope to change attitudes of some landholders with respect to using Fraser Island natives and the issue of dumped garden waste. Taking plants established through FINIA’s nursery project (now managed by Fraser Coast Regional Council), along with the expertise of Michael Lowe and Juliet Musgrave, designs were developed for the gardens with the approval of the resort’s management using a selection of native plants including Austromyrtus dulcis (Midyim), Dianella caerulea (Blue Flax Lily), Carpobrotus glaucescens (Coastal Pigface), Podolepis longipedata (Podolepis), Dodonaea viscosa (Sticky Hop Bush), Dillwynia retorta (Healthy Parrot Pea), Hovea acutifolia (Forest Hovea), Leptospermum polygalifolium (Wild May), Hibiscus diversifolius (Swamp Hibiscus), Allocasuarina littoralis (Forest She Oak), Dampiera stricta (Wallum Dampiera), Acacia ulicifolia (Prickly moses), Goodenia rotundifolia (Round Leaf Goodenia) and Zornia muriculata (Zornia). The FIDO team then worked from 14-18 November to remove the existing vegetation and plant three new gardens on the roundabout, the grassed area adjacent to the tennis courts and along Easton Street. Volunteers included John Sinclair, Michael Lowe, Tokiko Dawson, Jane Minor, Pat Turner, Russell Close, Helen Moriarty and Harold Charles with support from Fraser Coast Regional Council. Volunteers also weeded Corky passionfruit, Brazillian nightshade, Lantana, germinating coconuts, Green panic and Pangola grass. In total the volunteers contributed 160 hours of work to the project with an additional 50 hours of in-kind support by the Council. The Eurong Resort has generously agreed to irrigate the plants until they can become fully established with a FINIA interpretive sign to be installed in 2012. This has been a great initiative and another wonderful example of FINIA collaboration. 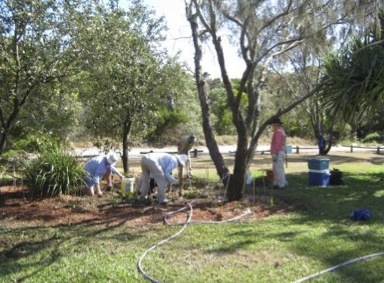 By finiaadmin in Cooloola Coastcare Association Inc., Fraser Coast Regional Council, Fraser Island Defenders Organisation, Gardening, QPWS, Volunteers, Weed and Pest Management on January 25, 2012 .